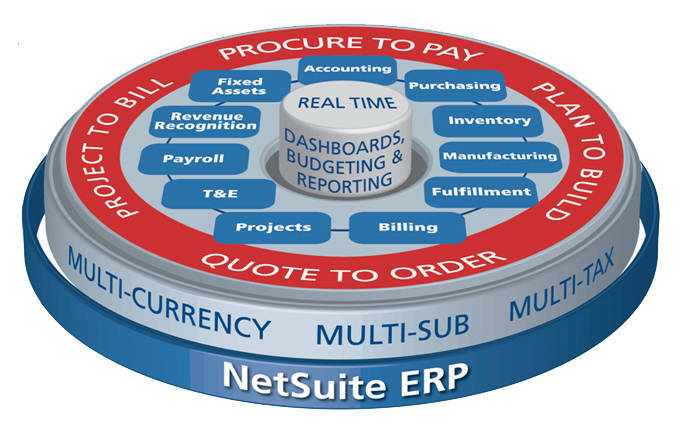 NetSuite’s solution for companies in media and publishing businesses provides the ability to manage all yofur customers—subscribers and advertisers alike—in a unique application that seamlessly integrates sales and order management with back-office financial and accounting processes within a single, flexible business application. In crafting NetSuite for Media and Publishing companies, NetSuite has leveraged experience and best practices from a host of media and publishing companies, complemented with a superior professional service implementation methodology and customization services. Manage both aspects of your sales: selling insertion orders to advertisers and subscriptions to your readership. Manage renewals for your subscribers. Integrate with other solutions you use to drive your business, such as DoubleClick, OpenAds, and other verification servers. Throughout all of this, your financials are securely and accurately managed within NetSuite. With NetSuite for Media and Publishing companies, you have one succinct view of your advertiser customer. At a glance you can see the status of your advertising sales in real time. You can manage your insertion orders and the related revenue tracking and recognition. And you have all the information you need about your advertising customers and ad agencies at your fingertips. NetSuite’s customer relationship management solution provides the ability to track all the information you need about your subscriber customers, their payment histories, and more, in one integrated system that delivers a single, real-time view of the customer. With NetSuite, you can even use our advanced renewal management system to make sure that you are actively renewing subscriber customer subscriptions. You can improve the efficiency of your advertising sales-to-cash processes, provide real time business analytics to help you make good business decisions, increase your customer service levels, and cut costs throughout the process. With NetSuite for Media and Publishing Companies, you can more easily market, sell and manage insertion orders. NetSuite facilitates order management of ads scheduled for multiple issues or runs. NetSuite workflow accommodates each conversion from insertion sale to order. Insertion orders that are to run over several editions of the publication can be segmented into multiple line items by date of production. The system auto-generates the line items on estimates or sales orders for each run of an advertisement, and can automatically invoice clients as each piece of the campaign is complete. For example, an order for an ad to appear in every edition of a monthly publication can be entered once, and then invoiced monthly as each ad appears. This allows publishers to track receivables, reduce the number of days outstanding for each sale, and increase their cash flow. NetSuite’s dashboards display the status of your insertion orders, easily identifying those forecasted and those booked, those awaiting fulfillment and the schedules of ad placements. You can tell the numbers and the revenue from insertion orders by sales rep or by run sheets, as well as all campaign status and impressions reporting—displayed on your dashboard for easy access. NetSuite allows you to simplify complex advertisement order fulfillment by tracking ad server and campaign IDs within NetSuite. You can automatically import the unique ID code from each ad placement into NetSuite by entry into the campaign line of the insertion order or through dynamic Web Services integration. And you can monitor and report on the success of impressions for each campaign line in the insertion order with NetSuite. Advanced integration tools allow you to synchronize campaign and insertion order numbering for easier, efficient tracking. The numbers of unique impressions—whether based on web traffic for on-line publications or on hard-copy circulation—are core to media purchasing. But while tracking may be based on raw numbers, billing is based on industry standard CPM—cost per thousand. NetSuite allows you to import the impression count data? and invoice your customer by CPM by automatically converting the numbers accurately for you. manage your subscribing customers, and better control your profit cycle—from advertising prospects through ad invoicing to up selling and retaining the advertisers for the future. Only with an integrated suite can you get accurate reporting on the end-to-end processes of your publishing business. Unifying your business processes with NetSuite gives you a full view of your business across all your departments, including sales, marketing, accounting and management. Armed with a 360-degree view of your company, along with crucial business metrics, you can make better, faster decisions. Plus, all leads captured on your portal flow automatically to sales representatives; similarly, online orders flow directly to your fulfillment and accounting departments. As a result, you minimize time delays and boost customer satisfaction. On the outbound side, e-mail marketing campaigns can be sent to static or dynamic marketing groups and you can monitor ROI and click-through results in real-time. Process productivity is made even simpler with mail merge and rich HTML templates. Want a Customized Media & Publishing ERP Demo? NetSuite’s dashboards provide real time reporting of any data collected in the solution. You can display up to the minute reports and comparisons of ads sold and billed, fulfilled, and remaining to be fulfilled. NetSuite for Media and Publishing Companies can automatically display reports by each advertising client, by the current status of ad placement against total ad displays purchased, and report on the ads published in each issue. And you can select the data and metrics that you want to track—from any aspect of your media or publishing business integrated with NetSuite. Our customers and partners can configure their NetSuite systems without the need for costly IT and developer overhead. For further customization, NetSuite is easily modified and extended with SuiteFlex tools. Software as a Service is both a breakthrough in technology delivery, and a powerful catalyst for changing the value proposition and economics of business management. Software-as-a-Service provides a lower cost of entry and typically requires less staff to implement because the need for onsite installation and maintenance are nonexistent. Additionally, on-demand solutions take less time to deploy. SaaS is more economical, faster and requires less human capital.